$25.00. Allows you access to The Haunt for the date purchased in the general admission line. ALL dates are completely sold out for our Haunt. The use of ANY tobacco or canabis products in any form is strictly prohibited. Violators and their party will be removed from the property. The castle is over 120 years old, and the Foundation would appreciate it if everyone helps us to ensure it stands for next 100 years. Tickets will only be available online and good only for the date they are purchased for. No exchanges. We do NOT offer refunds. All tickets sales contribute to the restoration of the Preston Castle. Rain or shine the Preston Castle Haunt will be open. The Preston Castle Foundation reserves the right to deny admission to anyone who is or appears to be impaired by or under the influence of any alcohol, drug or medication. 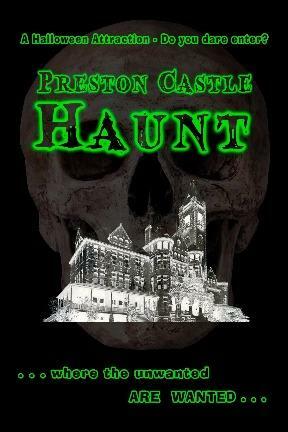 Our goal is to provide a safe, fun and scary experience of Preston Castle while raising money to preserve and restore the building and grounds. All of our Haunt personnel are volunteers who are giving their time, energy and expertise to make the Haunt a memorable experience for everyone. If you are interested in the history of Preston Castle, guided tours will resume in April, 2018. Visit www.prestoncastle.com for information about dates and times of tours and other events that take place throughout the year. Disclaimer: Women who are pregnant, people with heart conditions, or small children that attend this event do so at their own risk.